Kay wants to see our recipe boxes, and a recipe from inside it. She's calling it the Grandma Mabel Memorial Recipe Box Show & Tell Contest, after her grandma. I didn't inherit a recipe box from either of my grandmas, but I do have a number of recipes that Grandma Elsie (my mom's mom) wrote out for me. They're stored in one of three recipe boxes I have. The middle one is, I think, my first recipe box, although I've had the top two for so long that I'm no longer positive which I had first. The reason I think the middle one came first is that it's the one that has cookies, cakes, and desserts in it -- the good stuff! The bottom box was definitely the last, and wasn't really intended to be a recipe box. It's a little on the large size and has Clinique stamped on the top. It was part of a give-away - I have no idea what the folks at Clinique thought it might be used for! 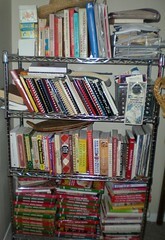 Of course, this represents just a small part of my recipe collection. I love cookbooks, and was spoiled by my house in San Antonio, where the eat-in kitchen has plenty of room for a bookcase full of cookbooks! On the bottom shelf, you'll see every volume of Southern Living Annual Recipes. I started getting them in about 1990, and picked up all the previous volumes (they begin in 1979) at Friends of the San Antonio Public Library book sales. Well, all except the very last one -- for years I was missing 1986, before my brother-in-law found it at a yard sale. I don't know which is more amazing -- that someone was selling just the volume I needed, or that my BIL remembered it! You can also tell from the second shelf that I love community cookbooks -- those published by church groups, women's clubs, etc. It's best, of course, if I know some of the people with recipes in the cookbook, but I also like older ones, from the 1950s and 1960s, even if I don't know any of the contributors! Kay also wanted a recipe, so I chose Grandma's Molasses Crinkles, one of the recipes I have in her own handwriting. Grandma always had cookies in the freezer, and this was one of my favorites. I think I'll make some this weekend. You can see that this recipe has been made a few times! Roll into balls the size of walnuts. Dip tops in sugar. Place sugared-side up 3 inches apart on greased baking sheet. Sprinkle each cooky with 2 or 3 drops of water to make a crackled surface. Bake until just set at 375º 10-12 minutes. Tip from Grandma: I just dip my finger in water and dab each cooky 3 or 4 times. Wow! Your cookbook stash beats my cookbook stash! I'm really enjoying reading everyone's entries to this contest! Aww, Grandma! The molasses crinkle recipe brought back memories. I'm going to make some this weekend, too! We are not baking more cookies! We have a lot of work ahead to work off the cookies we already baked and ate.. Tempting me this way is cruel. That middle box, it has a pattern that reminds me of my mom's "wedding" correlle. I love this mememathing. I'm wishing I had a recipe box! And good things come from the USPS, too!